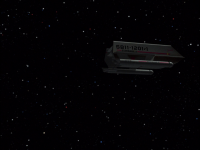 - Neither the first, nor the second part of The Menagerie is essential viewing if you're trying to plow through only Star Trek's essential exposition and stand-out classics, but it's definitely among the better episodes. If you do decide to watch The Menagerie, I recommend skipping The Cage unless you're willing to put up with the clip show to get the additional texture. - This episode unfortunately inherits many continuity errors due to reusing material from The Cage. See my review of The Cage for a complete list of them. - Unfortunately, this episode also adds to The Cage's list of continuity errors created by future episodes retconning earlier material. 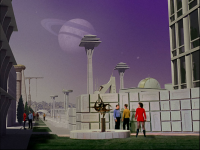 In the document Kirk reads about Talos IV, the text makes several human-centric references that imply that Earth is a nation of humans, rather than Earth existing in what will eventually be referred to as The United Federation of Planets, the multi-species nation Star Trek eventually became famous for. 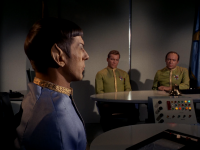 The text of the document even explicitly calls out Spock's half-human, half-Vulcan nature as if aliens living among humans is unusual and expressly forbids humans (rather than citizens of the Federation) from visiting Talos IV. All of this is caused by the fact that at this stage in production, the idea of the Federation had not yet been established by the writers. 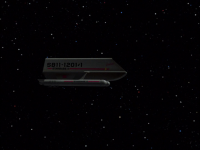 The Federation was introduced in a much later episode, retconning all of this stuff in the process. - The events of The Cage take place 13 years prior to the events of this episode. 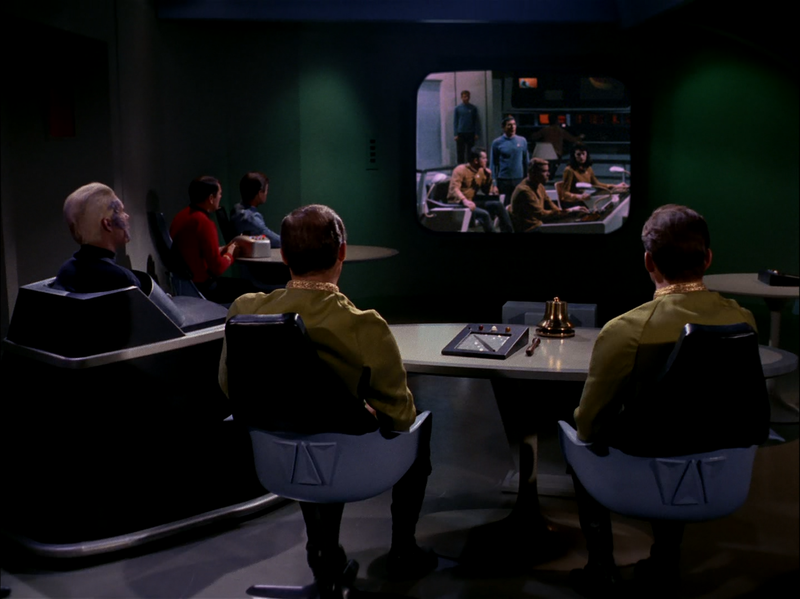 - When Pike was promoted to Fleet Captain, he ceded command of the Enterprise to Kirk. That is when Kirk and Pike first met. - Spock served with Pike for 11 years, 4 months, and 5 days. 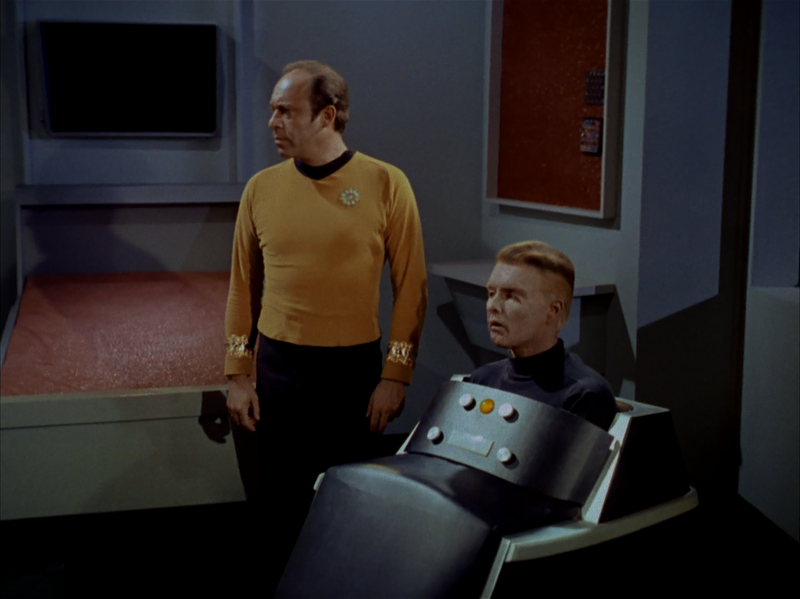 - This episode (both parts) won the 1967 Hugo Award for Best Dramatic Presentation. - Kirk blindly defending Spock's good name regarding the phantom transmission. - Spock sneaking around; up to no good. - Spock fighting with the starbase officer. - Spock taking over the Enterprise. - Spock submitting himself for arrest. - Spock completely outmaneuvering the captain and the commodore at the trial. Spoiler warning: my review of this episode assumes you've seen Star Trek's pilot episode "The Cage" which is the unaired episode that the clips Spock shows in this episode were originally filmed for. You should be able to find The Cage in the extras either at the beginning or the end of your home video collection. My review of this episode does not discuss or analyze any of the events of The Cage itself, but instead focuses solely on the new events in The Menagerie and assumes that you have already seen The Cage. If you're looking for commentary on the events of The Cage, then please read my separate review of that episode first. If you're not planning to watch The Cage, I recommend waiting to read this review until you've seen both parts of The Menagerie to avoid spoilers. The Menagerie, Part I is a cleverly written episode which rises above the many already-established cliches in Star Trek to tell a story that is fresh, new, and unique despite it merely being a shameless framing device so that the unaired material of The Cage could be put to good use. Even the title of this episode "The Menagerie" is a reference to one of the lines spoken by Pike in The Cage. As for the actual clip show, I don't know whether it was good preplanning or just some damn fine luck that the Talosians as written in The Cage had the ability to show people illusions, because it provides quite a clever way to substantiate their ability to show the court the entire episode in flashback form. 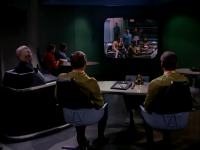 The crafty way the clip show was integrated into the episode was certainly among its most memorable qualities, but the centerpiece of the story is Spock going off on a crazy quest against orders, then getting caught and having to defend himself in a court martial. Unfortunately the court proceedings are admittedly weakly written. Why is Spock still able to give testimony after having plead guilty? 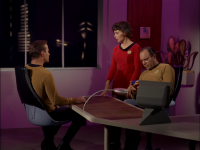 Why should Kirk be punished too because of Spock's actions? Why is the death penalty of all things considered acceptable for such a minor transgression? Why was court declared to be in recess at the end of the episode? What is this recess being used for? These are all trivial questions and there are some fairly trivial answers to them if you're willing to be imaginative. But they all stick out as minor plot holes the episode was unwilling to explain away and were unnecessary details to begin with. Better writing could have avoided the awkwardness. That said, Spock being put on trial for his actions was a fantastic dramatic choice and Spock having manipulated everything carefully enough so that he could control the court proceedings up until the cliffhanger was a delightful touch. 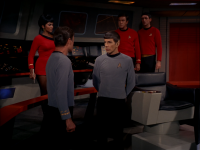 On a related note, Kirk and McCoy debating with each other over whether or not Spock was capable of treachery was a terrific scene and placing the scene just prior to Spock stealing the ship was an excellent counterpoint. In addition to being the first episode to feature a cliffhanger, The Menagerie is also the first episode to feature a shuttlecraft. 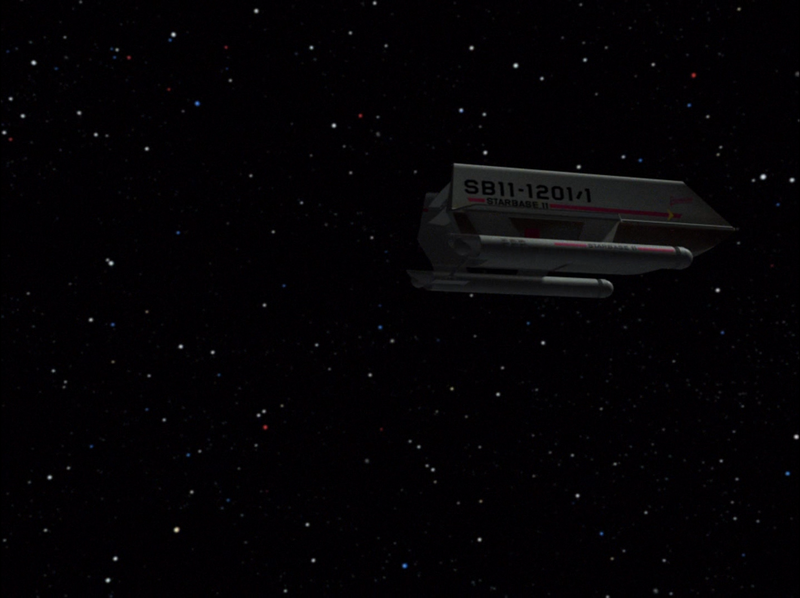 The shuttle Kirk and the commodore use to attempt to catch up with the Enterprise is intriguing in its design and capabilities; it was presented much as I would expect a shuttlecraft to be like given the technologies at their disposal during this time period. It was futuristic, high tech, and even roomy by our standards of space travel, but compared with a ship as advanced as the Enterprise the shuttle was scaled down both in size and capabilities. A commendably realistic technological portrayal given what assumptions we can reasonably make about their technological advances from our perspective. 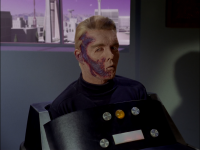 It might be tempting to pick on poor old Captain Pike for his rather pitiful wheelchair that only lets him beep things to communicate, but I felt that the episode did a fine job of substantiating this. McCoy makes a big point about how the study of the brain has advanced little over the years. Given that, even something as simple a rudimentary neural interface is a technology light years beyond anything we've got. Crafting a custom wheelchair just for Pike that allows him limited mobility and limited communication is quite an achievement by itself. Just because these people have transporters and warp drive doesn't mean they're magical wizards. Giving them limitations is what makes them human. 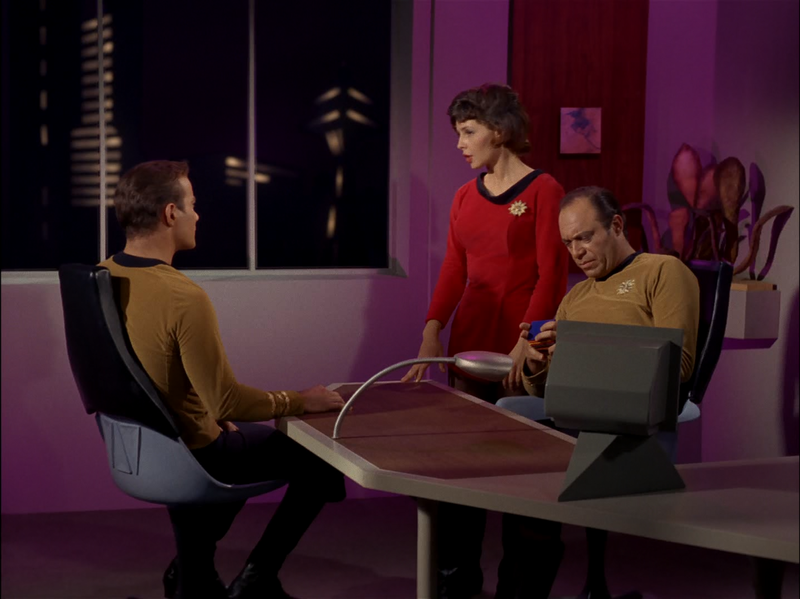 This episode ends on both the most dramatic point of The Menagerie, since Spock seems to have lost control of the situation for the first time in the episode, as well as ending on the most dramatic point of The Cage, when Pike is abducted, which is another nice touch. I was pleased that the first thing that came out of Kirk's mouth upon witnessing the footage was a demand to know how Spock could have created it and I greatly enjoyed how Pike slowly started to come around to Spock's side. For a character who can only beep yes or no, he was surprisingly compelling. Overall, this is easily the best episode so far in what has mostly been a sea of duds. 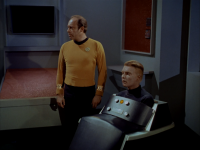 - another problem: the peak of the absurdness in this episode is how easily Spock gets off the hook. Last time I checked this was a military organisation, and stealing a starship, insubordination and mutiny, for whatever cause other than protecting the lives of millions against an evil superior is still punishable. So now all of a sudden it is ok because it was an act of compassion? Yeah right. - another highlight: Kirk, acting as a jury member in the trial against Spock. This is one of the very few occasions we see what a hardass military commander he can be - calm, cool, deadly, convicting Spock to death because this is what military law calls for. We tend to forget this side of him because most of the time he is all chummy with the crew and all angry and emotional with the enemy. Now I understand why he got to command a starship with a crew of 400+. Great site. I do wish to participate in the future. I still enjoy watching it today. I really can’t separate Part One from Part Two, they are linked together and that is the way I will review them. Although I do agree with Kethinov as far as Part One being far superior to Part Two. However, like Kethinov pointed out there are numerous questions that pop up about both episodes. I am not sure I would call them “trivial” as he does, but as he correctly pointed out in his review they could be explained away. Well most of them but not all. I just wish the writers had spent a little more time on explaining them. I apologize in advance to anyone who takes offense at this, but just because I have questions about the Menagerie doesn’t mean I don’t think it is a terrific episode. I just feel it isn’t the best written Star Trek episode. I could name quite a few “mistakes” in both episodes but I will limit my criticism to just two mistakes or problems. And they are whoppers. 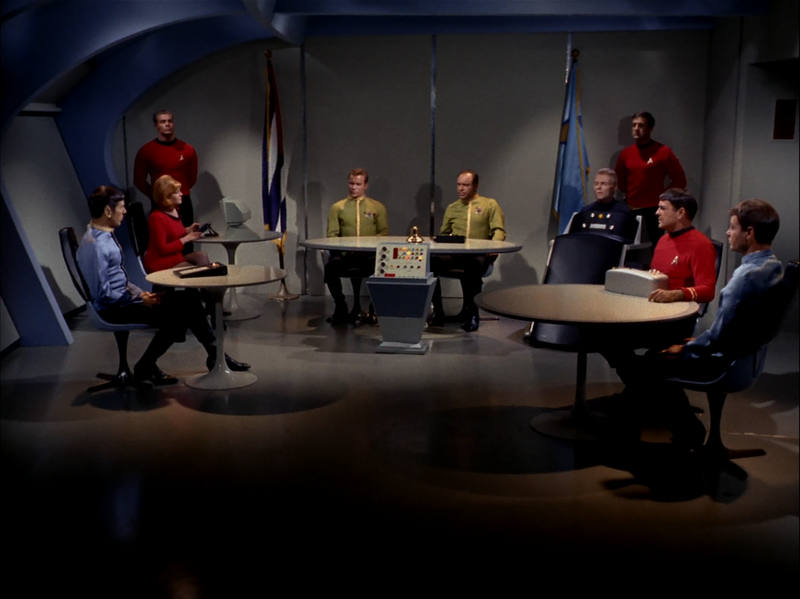 The biggest problem with the Menagerie is that it is based upon the court martial of Mister Spock. Why is this a problem you say? Because in order to conduct a court martial you have to have three officers of command rank onboard. Since leaving Star Base 11, Commodore Mendez was an allusion created by the Talosians. 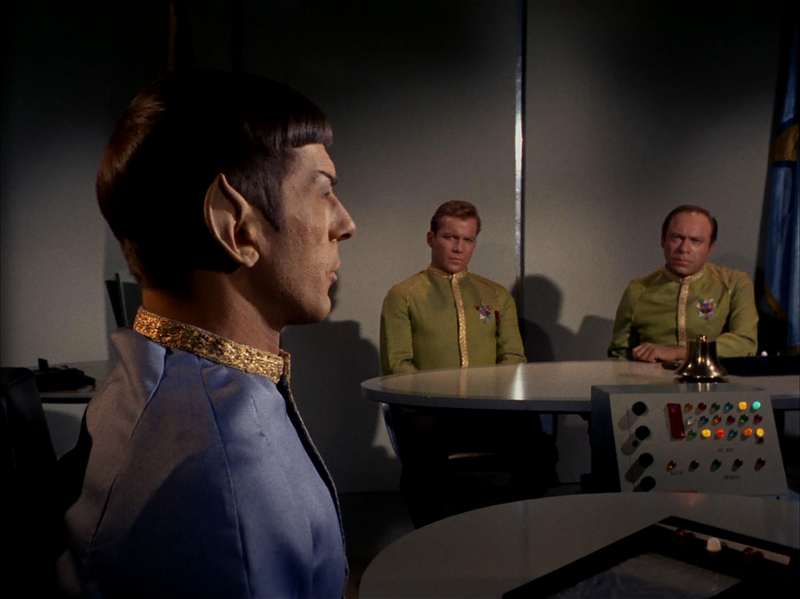 Therefore you did not have three officers of command rank onboard; Ergo, Mister Spock could not have been court martial! However, this raises an even bigger and more serious issue to the story. 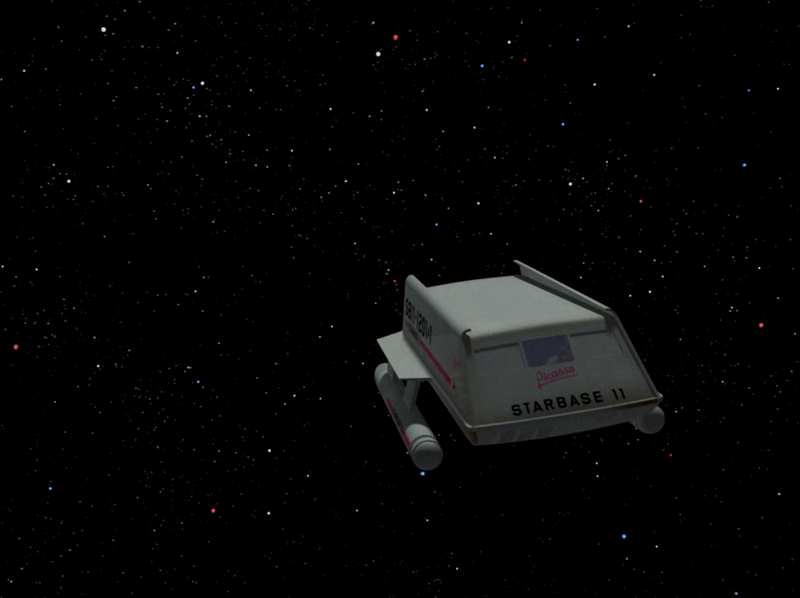 If the Talosians could send their allusions all the way to Star Base 11 then why all the charade? 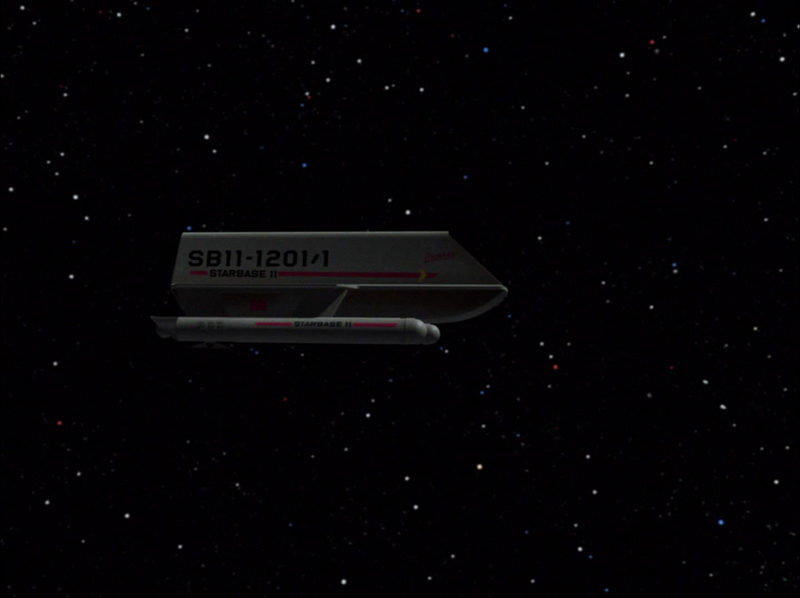 When the Enterprise got to Star Base 11 the Talosians could have just created the allusion that everything was normal and Spock could have taken Captain Pike to Talos and gotten back to Star Base 11 and nobody would have been the wiser! Granted, it would have been difficult to stretch that into a two part episode! LOL! 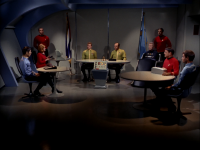 Nitpick: I could say something about Star Base 11 having back to back episodes( based on the way the episodes were filmed ) of a Court Martial against Kirk and then one against Spock, but I won’t! LOL! 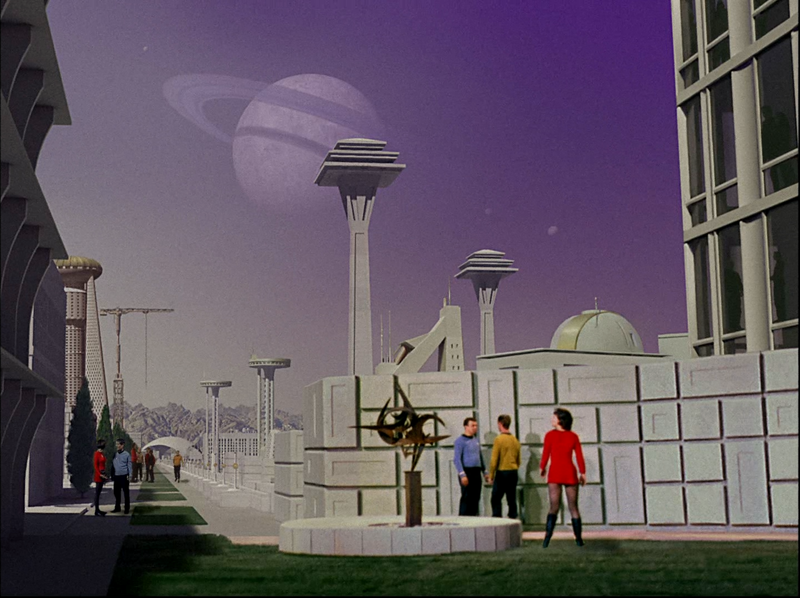 It is a good thing the Enterprise never went back to Star Base 11. Dr. McCoy or Scotty would have been next! LOL! More Nitpick: When they were questioning Pike did anyone ever think of asking a Vulcan to Mind Meld with him? Just asking. Mike, we don't need a mind meld. See my last comment. 50 intelligent questions that can be answered "Yes" or "No" will get to the bottom of almost anything. I do believe we may assume that in the 23rd century, folks will still be able to ask intelligent questions.